It might be a good time to have popcorn ceiling removal from your St Petersburg ceilings if: Your popcorn ceiling is starting to look yellowed and dirty, or if you're ready for a more modern look. If you answered yes to any of these, then you have found the perfect ceiling contractor for the job. We can remove the popcorn ceiling and apply a more updated texture. There are several textures to choose from. Knockdown and Skip Trowel are our most popular textures. We are very meticulous starting with the prep work which includes drywall repair, all the way through to the texturing and painting. After the popcorn is removed and the new texturing is complete, it's time to prime and paint. You can paint it yourself or have us do all of the work; as we are a fully insured painting contractor as well. Arrowing Painting is a professional interior and exterior painting contractor. Our projects range from large residential and commercial painting contracts to smaller interior and exterior jobs here in St Petersburg, Florida. We are a family owned and operated business, offering quality painting services. We are committed to providing the highest quality painting and repair services to our clients. We will always listen carefully to our customers concerns and provide honest and fair responses. Having worked extensively with general contractors and homeowners, our blend of "old school" craftsmanship and the latest technology has earned us high acclaim within the industry. In addition, we maintain Current General Liability insurance, Workers Compensation. 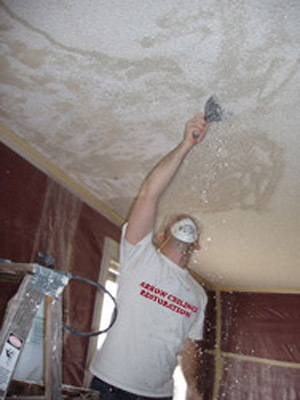 If you're looking for a St Petersburg Florida Ceiling Contractor Specializing in Popcorn Ceiling Removal, Popcorn Ceiling Repair, Drywall Repair, and Texture Ceilings and Walls, contact Arrow Ceiling Restoration today at (727) 804-5411, or complete our estimate request form.